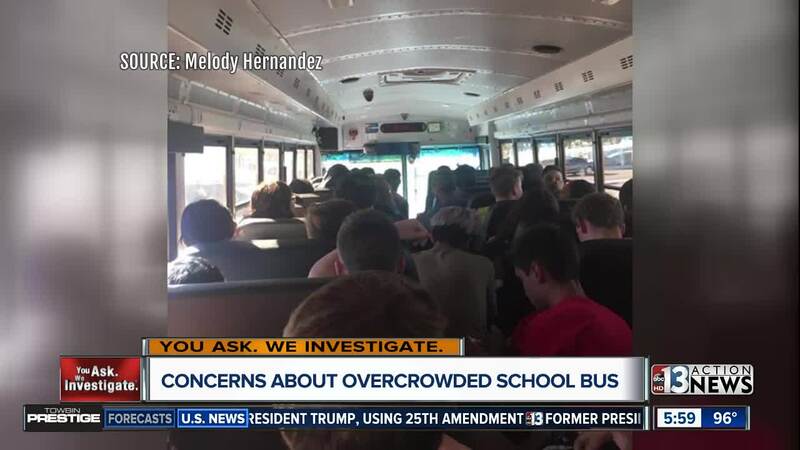 Concerns are swirling after some questionable photos stemming from a recent ride on a Clark County School District bus popped up. Melody Hernandez says her teen daughter was on the "late bus" from Ranch High School to Valley High School this week when it became clear there were more students than seats. "She said there's a lot of students on the bus and she sent me a picture," said Hernandez. The photos show some students sitting in the aisle of the bus. "She asked the bus driver if another driver could be called to come over because it was too full and [the driver] said that she didn't have time for that and that was how they could sit," said Hernandez. Hernandez claims she was floored when her daughter revealed what else the driver said. "[My daughter] told me the bus driver told the children for the girls to either sit on the boys lap or the boys to sit on the girls lap or to sit on the floor," explained Hernandez. "My daughter said that was out of control and I will not sit on a high school boy's lap," said Hernandez. Melody said she called the Clark County School District Transportation office to get an explanation. "The gentleman at the transportation office said no children are supposed to be squished in like that," said Hernandez. 13 Action News has continued to hold the district accountable for bus issues, especially during the 2017-2018 school year. District officials told 13 Action News in July they were working to address parent concerns. "We want to make the public satisfied with our services at all times but again, when you think of the immensity of our organization, things happen," said Clark County School District Transportation Director Jim Reynolds in July 2018. “The number of students who utilize the after-school activity bus fluctuates daily depending on how many students stay after for activities. “If needed, an overflow bus can be dispatched to assist in transporting students. The statement did not address the purported comments by the bus driver. Hernandez tells 13 Action News a district transportation supervisor was going to review the bus' video to determine what happened.